Aztec society was rich in arts, literature and culture that flourished over several centuries even after the conquest of the empire by the Spaniards. However, the Aztec language did not have a fully developed system of writing since it lacked alphabets and instead messages were conveyed through pictographs and various drawings. Thus Aztec writing, before the advent of the Spaniards, did not have the system of a written script and almost exclusively depended on drawings and pictographs. Just like various elements of Aztec art and culture, Aztec writing was also heavily influenced by the previous Mesoamerican cultures. It was an adapted form of the previous writing systems that existed in Central Mexico, in particular the Zapotec writing whose influence can be seen in the first Oaxacan inscriptions. 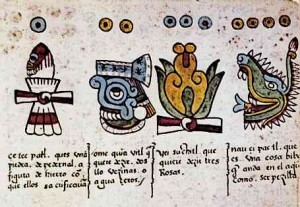 The Aztecs, however, developed the technique of pictograms and wrote a variety of codices to transfer oral knowledge. The language of the Aztecs was called the Nahuatl language and it had influences of other language families from the Mesoamerican linguistic area such as Mayan, Oto-Manguean, and Mixe-Zoquean families. The Nahual language, with the passage of time, became dominant in the Aztec Empire even though there were various other languages and dialects spoken in the region. With the establishment of Tenochtitlan, Nahuatl speakers were attracted from many different areas and added traits to the language. Since the Aztec writing did not exist in the form of modern writing containing alphabets, education in Aztec schools was given from the codices containing pictograms. Since the Aztec writing did not exist in the form of modern writing containing alphabets, education in Aztec schools was given from the codices containing pictograms. These drawings were used to disseminate information and knowledge which was passed in the oral and pictographic form from previous generations to the next ones. A good part of their education did not require Aztec writing. For instance, the basic military training was a practical aspect of education and did not need any help from Aztec writing. The Pictographic system was central to Aztec writing and this was the main way of transferring knowledge and information in Aztec society. There was a separate profession of codex painting in Aztec society and the painters received proper training at schools for the nobility called calmecas. These schools also took some common children who displayed exceptional talent for pictography. Pictographs were used for recording important events, tracing genealogies of the ruling class, recording court processing, and for other details. Aztec writing sometimes also made of phonetic rebuses in order to bring out the meaning of a concept. This was done when it was difficult to depict a concept graphically. In these cases, a logogram was used for its phonetic value instead of its meaning in order to represent another root, suffix, or syllable which sounded identical to the logogram. In the absence of a proper writing script, this was a reliable way of conveying the meaning of difficult concepts. Aztec pictographs, which constituted the unique Aztec writing system different from the writing system containing alphabets, were recorded in various codices which acted as a primary source of Aztec culture. A lot of these codices were actually written in the colonial era but made abundant use of Aztec pictographs existing during the pre-Columbian era. Some of the most famous Aztec codices include Codex Borbonicus, Boturini Codex, Codex Mendoza, Florentine Codex, Codex Osuna, Codex Tlatelolco, Codex Aubin, Codex Cozcatzin, and others. A very important component of the tradition of Aztec writing was the Aztec Calendar, in particular the concept of Tonalpohualli meaning “day count”. It consisted of a cycle of 260 days which were represented by a combination of numbers from 1 to 13 in addition to one of the twenty day signs. Symbols of different animals and things were used on the calendar against different alphabets. For instance, 1 is used with crocodile, 2 with wind, 3 with house, 4 with lizard, and so on. The cycle of numbers and day signs realigned after every 260 days. Aztec writing had its own number system which used 20 as its base. The names for the powers of 20 were cempoalli for 1×20, centzontli for 1×400, cenxiquipilli for 1×8,000, and so on. The “ce” prefix at the start stands for “one” and is replaced with the corresponding number in order to get the names of other multiples of the power. This system was used for the calculation of tax and tribute which was important for the empire. Aztec writing also had its 365-day calendar called Xiuhpohualli. It consisted of 18 months with 20 days each. These months were called veintenas or metztli. There was also a separate five-day period at the end of each year known as nemontemi. Aztec held their religious ceremonies and feasts at the end of each month and an important component of these ceremonies was the Aztec human sacrifice. The famed Aztec calendar consisted of two calendars. One was the usual 365-day calendar called the xiuhpohualli while the other one was a 260-day ritual calendar known as tonalpohualli. The former was used for calculation of ordinary days while the latter was the sacred calendar used for the calculation of religious ceremonies. The term “calendar round” is specifically used for the 52-year century that both these calendars formed together. To keep record of personal names, places, and historical events, Aztec writing made use of pictorial logograms. For instance, logograms are used in Codex Mendoza to keep records of the Aztec army conquering other city-states. The “conquered” glyph shows a temple in smoke and flames with its top destroyed. This represented the conquered city with its name written beside the logogram. To make the situation clearer, Aztec warriors are shown with the captives along with the destroyed temple. Aztec writing did not have a fully developed writing system due to the lack of alphabets but they made rich use of pictograms and logograms to transmit information and knowledge down the generations. 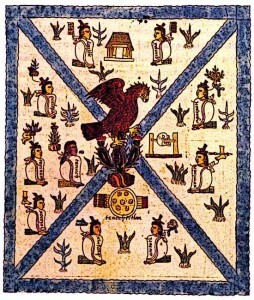 Aztec pictograms and logograms are preserved in a variety of codices. Additionally, Aztec had their own number system using 20 as its base which was used for the calculation of tax and tribute. They also had two calendars, one for the calculation of ordinary days and another for keeping track of religious ceremonies.